When your HVAC unit went out, how did you go about looking for a company to fix it? Did you do a quick Google search? Did a friend or family member give you some names of a few local Myrtle Beach HVAC companies? Did you call the company you bought the AC unit from? Or did you go online and look at reviews of a few local companies and come across Beach Air? We pride ourselves on taking care of our customers here in Myrtle Beach and appreciate it when they leave us a positive Google Review, Facebook review or feedback somewhere else on the internet. Have you had a positive experience with Beach Air? If so, we would LOVE it if you took 2 minutes and left us a sparkling review on Google. 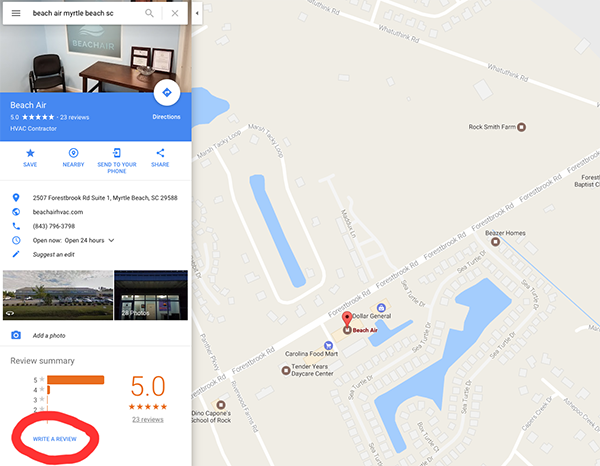 Click the image below to take you to the Beach Air Google Maps page and click 'Write A Review' that is circled in red. Log in to your Google account and type away! We want to make sure that anyone along the Grand Strand of Myrtle Beach who is looking for a local HVAC company can see everything that we have to offer. Thank you for your business!